Crafting With Craig: Tonic DT card. Here is yet another card using one of tonics brand new pick of the week dies. Very different colours for me, well colour. Love using black but have gone with a blast in your face of bright pink and black just to help settle the brightness slightly. Indulgence elegant vine square die set. Background paper from butterflies beautiful classic 8x8 paper pad. 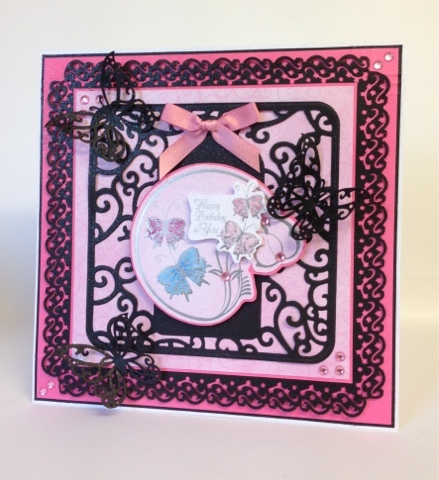 Butterflies beautiful bumper die & topper set. BazZill basics - black textured card stock. Hobbycraft - bright pink card. Multicoloured Spray & sparkle (all over page) - Crafters Companion. American Crafts - 10mm pink satin ribbon.